This Evaluation is a Whole-of-Project Evaluation of USAID/BiH Project 2.2, Improved Economic Aspects of Governance Relevant to Business Activity. Two activities contributing to the purpose of this project— the Energy Investment Activity (EIA) and the Fiscal Sector Reform Activity (FSRA)—have been implemented by USAID/BiH within the current Country Development and Cooperation Strategy (CDCS) period examined under this evaluation, beginning March 2014, when the 2.2 Project Appraisal Document (PAD) was finalized. The Energy Investment Activity (EIA) is a $5.47 million activity for the period from September 2014 to September 2019, which is being implemented by Advanced Engineering Associates International. The purpose of the EIA, as specified in the award, is to increase investments in the energy sector in BiH and advance the BiH accession process related to energy requirements by working on the following tasks: improving coordination, management, and transparency at all levels of BiH’s regulatory framework, making a simplified energy investment environment, and targeting technical assistance to integrate BiH’s energy sector into regional and EU markets. The Fiscal Sector Reform Activity (FSRA) is a $5.0 million activity for the period December 2014 to September 2019, which is being implemented by FINIT Consulting, a local contractor. As specified in the award, the FSRA supports efforts to facilitate gains in fiscal sector and public investment, which in turn should result in an increase in private domestic and foreign investments in BiH. The focus of the activity is fiscal discipline, which entails a comprehensive set of initiatives tackling coordination between the different levels of the BiH governments, and additional work with governmental institutions such as the tax administrations. 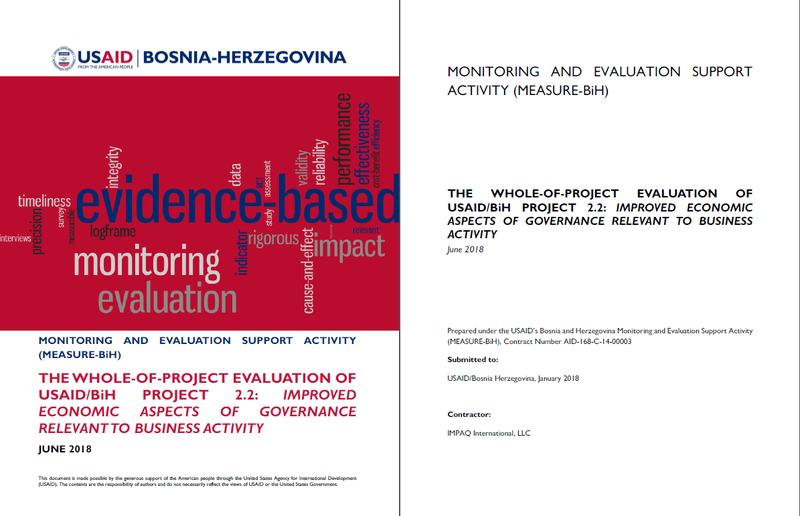 The purpose of the whole-of-project performance evaluation (WOPE) is to examine the entire USAID/BiH Project 2.2, including all of its constituent activities, and progress toward the achievement of the project purpose. To what extent were the programmatic and contextual assumptions identified in the project theory of change sufficient to achieve the purpose of Project 2.2? To what extent have the activities implemented under this project achieved their expected results, and to what extent have they been able to address and collectively contribute to the purpose of Project 2.2? To what extent have the activities implemented under this project been coordinated and how have internal and external activity/project management practices supported progress toward the purpose of Project 2.2? The evaluation team used a mixed-method approach based on an extensive desk review of implementation documents and databases received from USAID/BiH as well as additional documents collected from the EIA and FSRA activities, semi-structured interviews with 63 key informants (KIs), and a mini online survey of a sample of enterprises in BiH.